A sold out crowd attended the March 11th Architects for Animals “Giving Shelter” benefit for FixNation at the HermanMiller showroom in Los Angeles, and the evening event was a smash success. The inspiration for the form comes from the Chinese symbol Taiji, or more commonly known as yin-yang. The symbol itself is made up of two fish, white and black, and represents the dichotomy between opposite energies and how they are connected and interdependent, just like the cat and fish. The fish make up the form while the cat rests inside, and the layers of the structure are spaced apart to allow the cat easy viewing out of the house while remaining safely hidden within it. The multiple points of access and platforms allow the cat to use the house in a variety of ways. By letting the cat become the fish, we are giving the cat the freedom to see the world while safely being shielded from it. 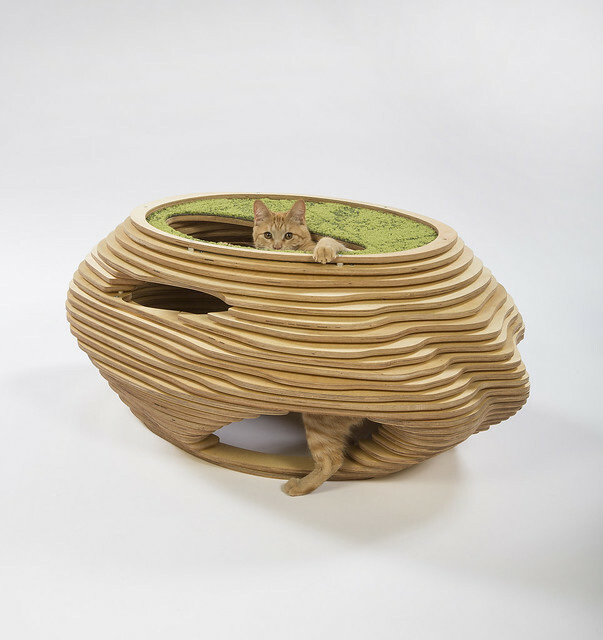 Like the famous land art sculpture, our cat shelter is best experienced moving around it. Nine bands in three colors twist together in a dynamic helix, creating a “cat cone” that provides shelter, rain cover and ample ventilation for L.A. Cats. Made entirely of 3D-printed components and using no framework or adhesives, Spiral Kitty uses the geometry and aggregation of “structural shingles” to produce a lightweight, interlocking, reciprocal structure. At night, one third of the shelter glows luminous blue to provide a beacon for nighttime wanderings. The California Catcube is a concrete and reclaimed wood shelter, designed as a raised sleeping porch. The concrete’s high thermal mass gathers heat during the day, and slowly releases it overnight. The movable wood louvers may be opened to allow a breeze to flow though, or closed during cooler weather. Appealing to a cat’s desire for warmth, the catcube provides a secure shelter for a catnap. Designed and built by Standard. The reclaimed wood for this shelter was generously provided by East Teak. Over the years, we have found that cats love to occupy the great spaces in our larger architectural models. They are arbiters of architectural space. This figure/ground yin/yang play of spaces and places is a setting for the kitties to experience their inner architect. The formal game is a decades long exploration of solid and void versions of the same shape and how this gives light and structure an opportunity to dance and entertain. This welded steel structure is designed and fabricated by and at Lehrer Architects LA studio in Silverlake. Cat-à-Tête is a feral cat shelter which takes the form of a tête-à-tête, an S-shaped seat allowing face-to-face conversation. The structure provides a social framework for cats and humans alike. The entire structure of Cat-à-Tête employs a sustainable sheet material comprised largely of recycled plastic bottles – and is itself completely recyclable. Despite its constitution, the material is soft and possesses tactile properties similar to felt. Cats enter this soft structure through various openings, escaping their would-be predators. The protected interior is defined by laminated serial ribs and spatially organized in a continuous figure 8 circuit offering areas of rest, play, and observation. Alternating bays of material and open slots create plays of patterned light across the structure’s textured surfaces. The binary pattern of Cat-à-Tête’s serial construction points to the binary relationship between feral cats and humans – While the two may not directly cross-paths when visiting Cat-à-Tête, the structure’s form suggests an on-going inter-species dialogue through repeated binary alternation. The Lunar Cat Lander was developed to test the effects of low gravity environments on activities cats hold dear: napping, snacking, wallowing and laying in wait. It is hypothesized that distant planets and moons might support feline life if the correct balance of warm sunshine, string, dimwitted moths and small but precious breakables left near an edge exist in sufficient quantity. If a suitable environment is discovered the Lunar Cat Lander is easily deployed. What Intrepid Astrokitty wouldn’t be proud to call this their home away from earth? With String Theory, kitty acts a particle that jumps and slides between various planes and portals. A seemingly 2D elevation is disrupted by winding vertical and horizontal paths which we observe, as if looking through a double sided picture. Humans and cats alike are welcome in this Teatro de Gato, or for English speakers – Cat Theater. Not since Andrew Lloyd Webber’s signature musical “Cats” has Bustofer Jones a better spot to watch, Munkustrap a more booming place to meow, or Skimbleshanks a more entertaining venue to purr. Evoked from the profile of performing art theater acoustics, Teatro de Gato offers our furry friends the chance to take the stage (or backstage!) and for humans to take a seat. Cats distinctively have mysterious qualities, out design plays off of a cats mysterious personality, and reflects an abstract multi-dimensional Cat Silhouette. The nature of our structures’s contemporary interpretation and progressive materiality links a cat’s personality to a modern design aesthetic. Meet children’s book author Cynthia O’Brien! Spring Cleaning Tips for Cat Lovers! © 2011 FixNation, Inc. All Rights Reserved.